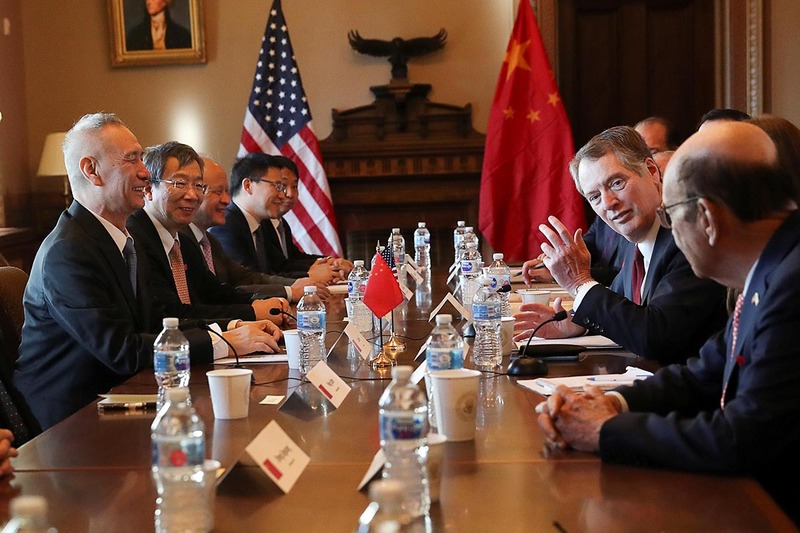 Cabinet-level officials, led by Chinese Vice Premier Liu He and US Trade Representative Robert Lighthizer, gathered in the Eisenhower Executive Office Building next to the White House, with about a month to reach a deal before a 2 March US deadline to increase tariffs on Chinese goods. During a photo opportunity at the start of the scheduled two days of talks, Lighthizer, Treasury Secretary Steven Mnuchin and other top Trump administration officials sat silently across a long table from their Chinese counterparts, ignoring a reporter’s questions. After a few minutes, Lighthizer broke the silence with joking small talk about table positioning and appearing in photographs from the meeting between US President Donald Trump and Chinese President Xi Jinping in Argentina last year. Meng was arrested in Canada on 1 Dec at the request of the United States, which is seeking to have her extradited. The talks in Washington are expected to be tense, with little indication so far that Chinese officials are willing to address core US demands to fully protect American intellectual property rights and end policies that Washington has said force US companies to transfer technology to Chinese firms. The US complaints, along with accusations of Chinese cyber theft of US trade secrets and a systematic campaign to acquire US technology firms, were used by the Trump administration to justify punitive US tariffs on $250 billion worth of Chinese imports. Trump has threatened to raise tariffs on $200 billion of goods to 25 percent from 10 percent on 2 March if an agreement cannot be reached. He has also threatened new tariffs on the remainder of Chinese goods shipped to the United States. China has retaliated with tariffs of its own, but has suspended some and is allowing some purchases of US soybeans during the talks. China is fast-tracking that new law, with the country’s largely rubber-stamp parliament likely to approve it in March. A crucial component of any progress in the talks, according to top Trump administration officials, is agreement on a mechanism to verify and “enforce” China’s follow-through on any reform pledges that it makes. This could maintain the threat of US tariffs on Chinese goods for the long term. As members of the Chinese delegation left their hotel near the White House, a small group of Chinese protesters held placards highlighting various grievances against the China’s government, including the unfair taking of properties. Some business groups watching the talks were tempering expectations for a breakthrough. With a month to go before the deadline, it was unlikely that either side would put their best offers on the table in the next two days, said Erin Ennis, senior vice president of the US-China Business Council. But the Chinese side would likely have to bring to the table a new offer that goes significantly beyond its previous offers to significantly increase purchases of US goods, including soybeans, energy and manufactured goods. People familiar with the talks said manufactured goods, a key priority for the Trump administration, were among the largest components of Chinese purchase pledges aimed at significantly reducing the US trade deficit with China. But here, too, there are “no guarantees” that Beijing would follow through on these pledges, one of the people said.